This time of year is always tough for me. I love the school supplies, and the cooler weather, and the return to routine, but it is hard when my Facebook feed is full of back-to-school pictures, so many blogs I follow are posting school lunch recipes, and Pinterest is swarming with pins of ways to make returning to school easier! Because my kids aren't "going back" to school. We will start school, of course, here at home. I won't get to kiss my kids goodbye and return to my quiet house where I can spend my hours as I please. I will be looking at curriculum and lesson plans, while trying to juggle cooking, cleaning and laundry. And I wish that didn't make me a little less-than-thankful, but it does. I know the grass is always greener on the other side of the schoolyard fence, but sometimes it is just hard to appreciate how hard I've worked to water my own lawn! I suppose in the same way that public school moms wonder "how we do it", I wonder how they do it. Do they get to enjoy immaculate houses and long, leisurely lunches? Do they read dozens of books and work out at the gym every day? I'm quite certain it is not as wonderful as I imagine it to be. And I could certainly put my kids in public school and find out! But I'm not going to. I truly believe that God has called us to homeschool for this season in our lives. If that season lasts until Carson graduates I am looking at at least 12 more years. And I don't expect anyone who feels called to send their kids to school to feel guilty-I am not the Holy Spirit! Ask the Lord what He wants you to do, and go confidently with that. And that's what I have to do when I am jealous over what I imagine must be the wonderful luxury of *not* homeschooling-I am sure that comes with trials and troubles all it's own. Instead I am going to focus on doing what I know I am supposed to do: trusting that the Lord will provide and continuing in confidence, knowing He will support me. So, maybe I will have to stay off the Internet for a little while, but I hope that the Lord will bring to mind all the blessings our family receives by following Him in obedience. Following the Lord's will is never easier, no matter the course, but it is the only thing that will ever lead to true contentment! I have to say: decorating for a wedding reception trumps any other type of party I have done, for sheer amount of craziness! It was great though-it definitely stretched my talents and the limits of my creativity. 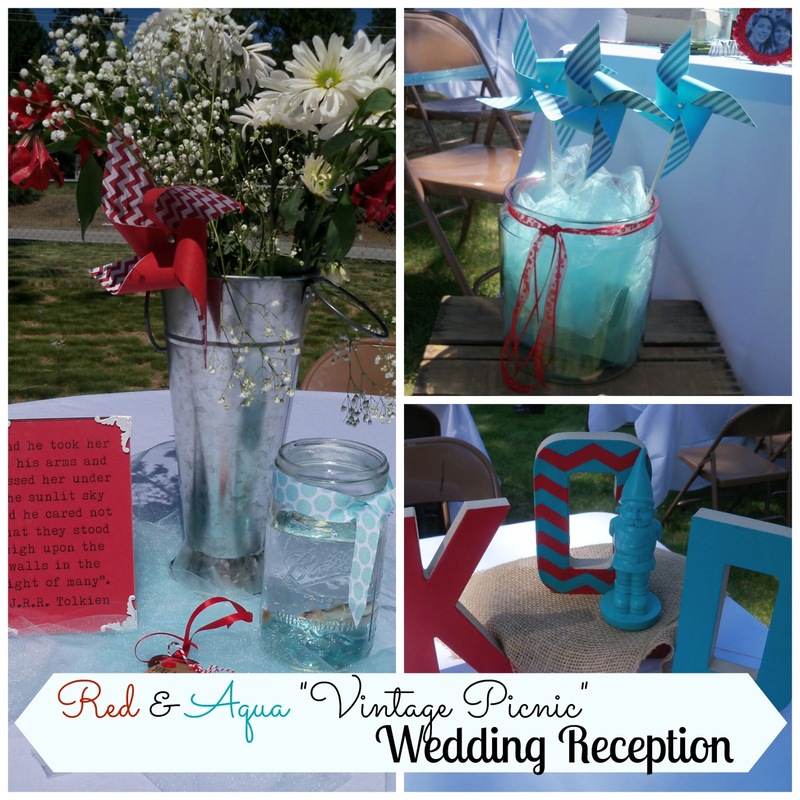 The wedding theme, like all party themes, presented both challenges and inspiration. In the end, I was truly thrilled with how it all came together-I just wish I had gotten more photos! Some of my favorite details weren't even truly decorative. The bride wanted pie instead of the traditional wedding cake (although we served both) and toyed with the idea of individual pies. However, all the food items (for the most part) were "Northwest" favorites, and I suggested that we serve Cyrus O' Leary's (a pie company native to Spokane, WA, where the wedding took place) and my sister Robyn found these great kraft pie boxes-and they came with wooden forks! It made it easy to serve pie to so many guests, and I indulged in a piece of Marionberry and was very happy. Each piece was labeled with the flavor (we served Marionberry-a blackberry specifically grown in Oregon, Cherry and Apple). They were tied with baker's twine, and they formed a circle tower before they were attacked! Each table had a different quote about love-selections came from the Bible, Shakespeare, Tolkien, Jane Austen, and even Star Wars. I bought the frames at the Dollar Store and spray painted the corners white. We printed the quotes on red card stock. Another little touch was the "vintage" keys-the groom has a fondness for old keys. We purchased them at Michael's, stamped kraft tags with "You hold the key to my heart" (tags and stamps from Hobby Lobby) and tied them with red ribbon and baker's twine. The bride plans to use the one she saved as a Christmas ornament. I was just thrilled that we found a stamp with such a perfect saying! Everything was grouped on blue tulle to help give it some definition from the white tablecloths. We had the reception in the church yard, and it was a great place for a wedding that felt like an old-fashioned box social picnic! The finishing touch of the table decor was goldfish. That is the bride's pet name for the groom, and I couldn't pass up the opportunity to use them. Just in case you were wondering-no goldfish were harmed! Several people were concerned that they might not make it in the heat, but we didn't lose any. We waited until the last possible moment to put them in the jars, and then they found homes with the guests after the reception. We used Mason jars in several places as decoration, and the fish were a perfect fit in two quart jars tied with ribbon (from Hobby Lobby). The gnome had a special place in my heart. He was the inspiration for the color blue that the bride wanted and I felt like he deserved a place of honor. He found a spot at the head table with the hand painted initials of the bride and groom. Grouped together, they formed the main decoration for the bridal party. Another touch that was truly inspired-instead of place cards for the attendants, I used photos-each of the bridesmaids with the bride, and each of the groomsmen with the groom. It added color, and made for a nice keepsake for each attendant. I also used white sheets hung on rope (tied around two trees) to make a "backdrop" for the head table. It really helped to define the space and looked so much better in the photos! I added these wooden crates to each end of the head table and used floral foam covered by tulle to prop more pinwheels in. It helped to ground the table and give it a little extra "something". I also adored the photo booth (it was my favorite area after the candy bar/buffet). I pick up the fun mustache and hat props, made a little tulle bow and stuck it all in some foam on a basket. The surprise hit was these laser cut frames. They were from Michael's and were a *steal* at $1.99 each! My sister spray painted them aqua, red and white, and I think you can see in the above photo that they were well worth it. We used a white sheet as a backdrop for the photo booth and added a bunting garland that matched the one used in the sanctuary for the ceremony. 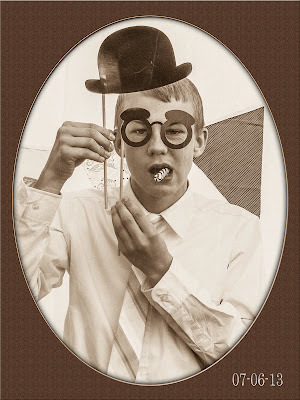 I could NOT resist adding this photo of my adorable little brother. Isn't he hilarious?! The photographer (John Rich, a sweet friend of my family, and his wife-who also did the flowers AND took photos, as well as a million other things) did an absolutely fantastic job. He edited this photo to its best potential. And I love it! I can't believe how many talented people used their gifts and talents to bless my sister and her husband. It was such a sweet outpouring of love, and I know that there were a lot who didn't get near the credit they deserved. I was honored to serve her in this small way, and I hope that the day was full of memories that they will both be able to treasure. I know it was for me! Don't miss the rest of the wedding series! FIVE Years! 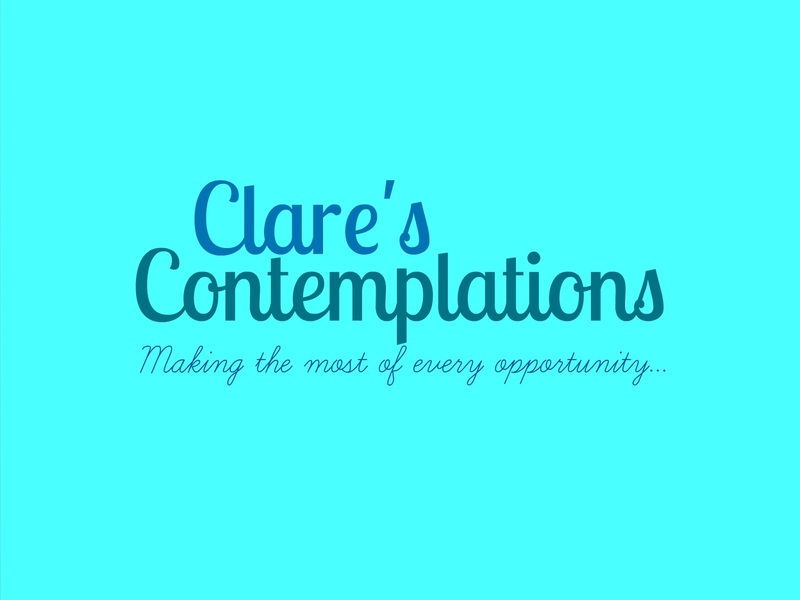 Happy Anniversary, Clare's Contemplations! I had no idea, when my aunt first started her blog, and told me I should start one, that it would still be going. It has been crazy, and I have covered so many things, and so much of my life has been documented for the world to see. My first blog post was only five sentences long and didn't really say much of anything! And now, today, it has been FIVE years! But I have to say, I am really proud of myself. I have fought, and tried, and given up, and tried again with this blog. It has taught me so much about myself, my pride and my fears, my loves and my needs, that I don't regret it. I know that 40,000 pageviews over the lifetime of a 5 year-old blog is literally nothing. But like I said in this post , I have to remind myself over and over that I am just trying my hardest to let God lead. 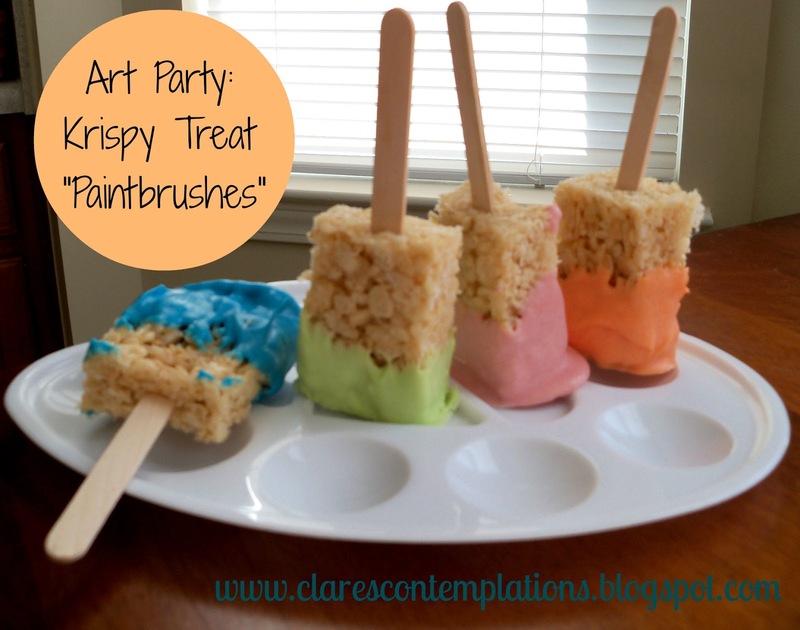 There are always lots of ideas that swirl around that I would love to try-hosting my own link party, giveaways, a weekly blog feature, but it just hasn't been the right time. 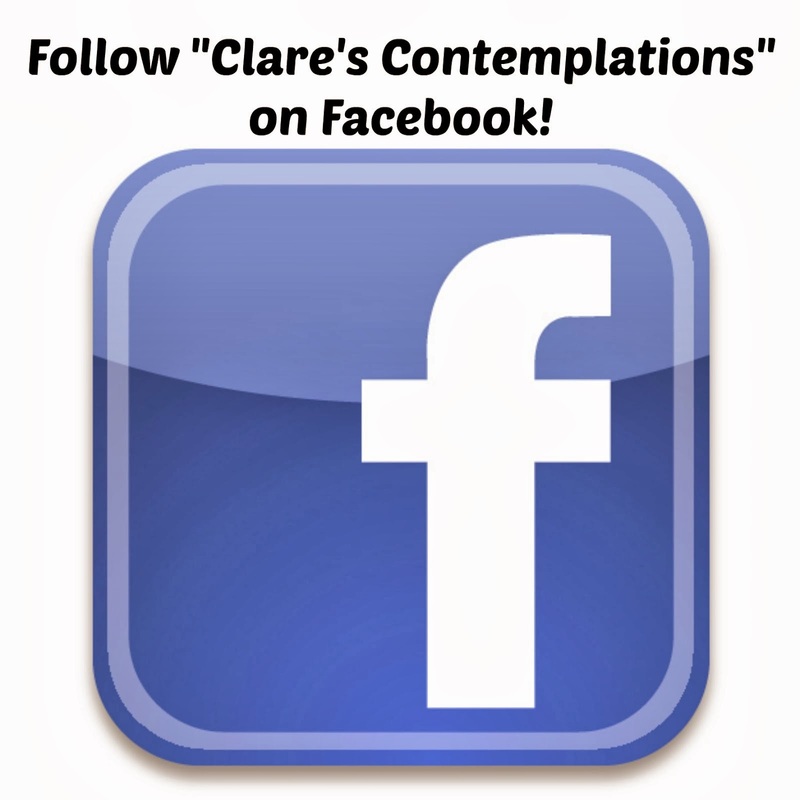 However, after a lot of prayer and consideration, Clare's Contemplations has its own Facebook page! 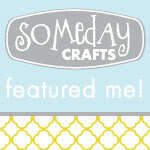 I would love, love, love it if you would "like" it on Facebook! 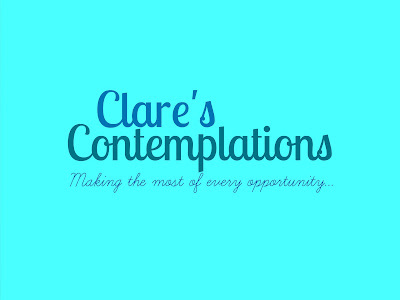 You can either click through here www.facebook/clarescontemplations, or use the link at the top of the sidebar. It is really nerve-wracking, because I know there are people out there looking at my blog, but they aren't commenting, and I am hoping Facebook will be a less stressful place for us all to interact. It is hard for me to put myself out there like that, but I just felt like the Lord was saying the timing was right. Followers:10. Just being honest here-that is really, really, sad. But whatever. Most viewed post: Superhero Baby Shower with close to 5,000 pageviews. Thank you, Pinterest! Most commented on post: The Hand of God with a grand total of 8! However, I have seen some things I never expected-I know that the Lord is working, and He is doing it in a way that will bring the most glory to Himself. So, I just keep praying about it and trucking along, and I know that He will bless it as He sees fit. I received official permission to post wedding photos, but after seeing this posts you will probably all be asking what you were waiting for. I have never claimed to be any kind of decent photographer, and being *in* the wedding party made photos so difficult! It will really take a while before I get over that I missed so many great shots, but I really wanted to be present-not trying to do anything but help my sister have a wonderful day. I think if I had been trying to take all the photos I wanted I would have missed out on so many other special memories! Unfortunately, you can't see those, so I will share what I took with you-no complaints, though, okay? We went to a beautiful park to take photos of the bridal party. It was my first experience with a "first look"- where the bride and groom see each other and take most of their photos before the wedding instead of after. There was lots of down time for the bridal party, since most of the photos were of the bride and groom, naturally. Lisa Dawn, Kelly and I took advantage of that time to goof around and take some of our own photos! The props were ones that I had purchased at Walmart for $0.50 and they turned out to be worth their weight in gold! The "real" wedding photographer brought them along for the shoot and we played with them on our own. The bridesmaids' dresses were 2 each of three different dresses-all in red. We arranged it so that the sisters each had a different dress. It was a lovely place to take photos, I was trying to work quickly with my phone, so the lighting isn't the best! I had the privilege of driving the bride-in my dad's expensive car! It was doubly nerve-wracking. You can bet there was plenty of praying going on! The flower girls didn't get to come to the park shoot, so we snapped a few quick pictures right before the ceremony. They are clutching their "thank-you" gifts from Aunt Katy! I really wanted a photo of Katy with Gwendalyn. I have one of me with Gillyan-who was only a little younger at my wedding, and it is one of my favorites. Aren't they just too photogenic? Really, the only decent photo I got of myself all day. The adorable pinwheel earrings were a sweet gift from one of the bridesmaids. She handmade matching earrings and bracelets for all six of us! Joel took the photos during the ceremony, because of course, I couldn't! Josie walked in with my youngest brother, Mark. She wasn't her usual chipper self-we found out later that she was running a fever! Gillyan walked with her brother, Gideyon. Aren't the boys' suspenders and bow ties the cutest? The entire bridal party! I cried far more watching my little sister walk down the aisle then I did at my own wedding! My aunt whipped up the adorable pennant bunting the night before and it was a perfect touch for the space. The ceremony was sweet-it had a lot of special touches. One of my favorites was that all the attendants walked down to a beautiful instrumental version of "Pure Imagination" from the original "Willy Wonka". It is one of our family's favorite movies and it was a sweet personal touch. My Carson and his Dad! Joel was amazing as always, and did a ton of little things for me, including making sure both our kids were dressed an at the church on time! The bride stopped by the candy table! I was bummed because her favorite, the gummy sharks, were all gone! But she did enjoy a piece of Laffy Taffy! My sister, Robyn, pretty much prayed Katy into existence. That is a really special bond, if you ask me. It was great that we all got to celebrate together. The bride, just chillin'. It was so wonderful that she enjoyed her special day so much. It was nice that all that work made for a memorable day! The two "besties"-Lisa Dawn and Katy have been friends forever! They were showing off their amazing fashion sense in their over sized sunglasses, or"facial windshields" as we call them! I don't think I have ever seen two happier people! This is a great shot of the cute blue flats Katy wore, too. 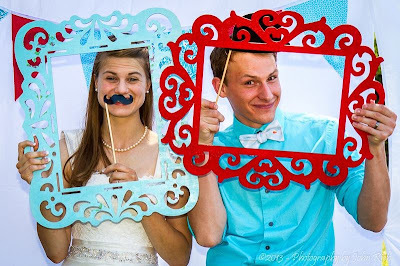 They were just the cutest couple and it was a great celebration of their love. Off to the honeymoon-car decor courtesy of Joel, my brother Clark and some of the groomsmen! I have one more post, of the few photos of the reception decor, and then the wedding post extravaganza will end at last!